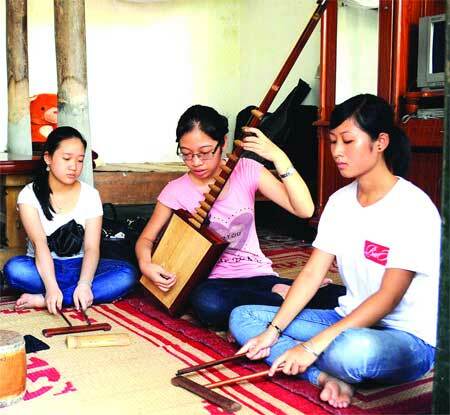 A national Ca Tru (ceremonial singing) festival will be held in Hanoi in august with the aim of preserving the UNESCO intangible heritage. Ca Tru, a traditional folk song of Vietnam or “Hat a dao” is an ancient kind of music featuring female vocalists with origins in northern Vietnam. 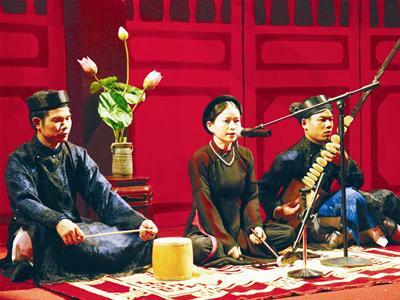 Normally, a group of Ca Tru comprises of three performers: a female singer making unique sounds by breathing techniques and vibrations and playing the clappers or striking a wooden box at the same time, and two instrumentalists producing the deep tones of a three-stringed lute and the strong sounds of a ceremonial drum. For much of its history, it was associated with geisha- like form of entertainment. Ca Tru was inscribed as an intangible cultural heritage in need of Urgent Safeguarding in October, 2009. The event will be organized by the Institute of Music under the Vietnam International Academy of music in cooperation with relevant agencies and localities with a tradition of ca tru. Ca Tru has existed in 15 provinces and cities including Hanoi, Ho Chi Minh city, Hai Phong city, the northern provinces of Bac Ninh, Bac Giang, Hai Duong, Hung Yen, Nam Dinh, Phu Tho, Thanh Hoa, Thai Binh and Vinh Phuc and the central provinces of Nghe An, Ha Tinh and Quang Binh. More than 100 artists from 15 Ca Tru clubs around Vietnam will attend the festival in Hanoi from October 13 to 16. Participants have the chance to exchange experience in preserving and developing the art of Ca Tru over the year. Ho Tuan Anh, Deputy Minster of Culture, Sports and Tourism stated that Ca Tru is of great value to both Vietnam and international music.